Gallo Pinto, a great way to start the day. It is a typical morning in Costa Rica, and my lovely bride is craving a “Tipical” breakfast. Costa Rica has always been an agricultural economy. Even though tourism is now the #1 industry, many folks still work close to the land. This hearty meal is just the ticket to “fuel the furnace” for another active day. 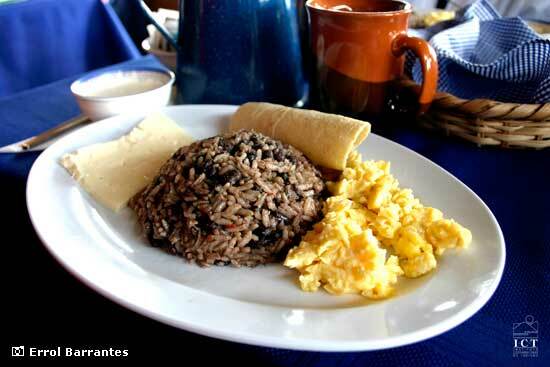 Tipical breakfasts include eggs, delicious local cheese, plantains, tortillas and Gallo Pinto. Of course, a cup or two of excellent local coffee completes the equation. Gallo Pinto is the national dish of Costa Rica. The main ingredients are black beans and rice. Recipes vary, but most cooks add onions, bell pepper, and cilantro, all fried together in a little oil. During the cooking process, the rice takes on the color of the beans. This gives the dish a speckled appearance, hence the name, Gallo Pinto. Or “Speckled Rooster” in Spanish. Gallo Pinto is omnipresent and served in virtually every restaurant in the country, from the fanciest hotel to the Burger King at the airport. If breakfast is served, you can bet that Gallo Pinto is on the menu. There are slight variants around the country, where local ingredients find their way into the dish. In Guanacaste, it is not unusual to find hot peppers. On the Caribbean side, we were surprised to find some shredded coconut. There is always another local favorite on the table too. No dining table in Costa Rica is complete without a bottle of Salsa Lizano. This mildly spicy condiment adds extra zip to Gallo Pinto, and almost everything else consumed here!